First off, how bout a little back-story? About two years ago, I signed up to be a vendor in a local Dallas craft bazaar with my mom and sister. We were in a mad rush to knit up all sorts of armwarmers, scarves, hats, and felted purses. For about three months straight, I was knitting every spare moment I had. I think the wool-fumes must have gotten to my brother in law, Aaron, cause one night he asked me if I would show him how to knit. I quickly cast him on for a felted purse and taught him the knit stitch. 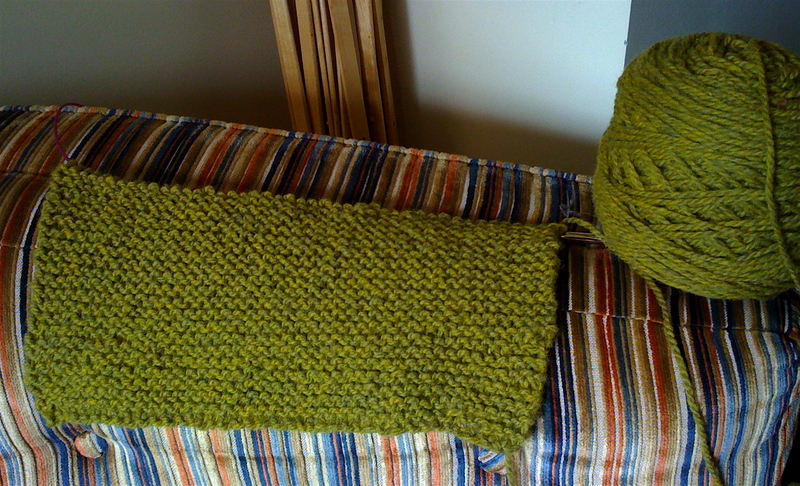 He picked it up pretty quickly, but had trouble with knitting way too tightly. I promised him it would be okay, since we were going to felt the purse and you wouldn’t even be able to see the individual stitches after the felting. 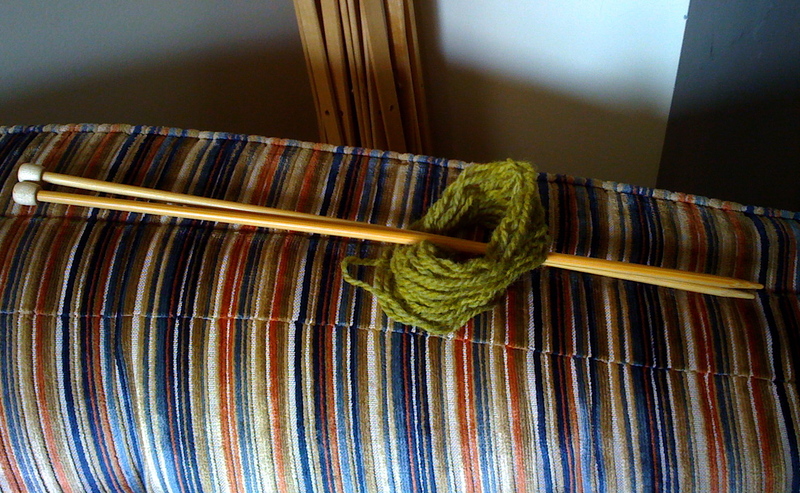 So along he went, knitting in the round (he didn’t even flinch!) with some Lamb’s Pride Bulky for a few weeks. And out came a great-looking grey felted purse that he allowed me to sell at my bazaar. I thought that had gotten the knit bug out of his system, because he didn’t immediately want to cast on for another project. He seemed content with what he had made and left it at that. Now flash forward to about a month ago: we are all hanging out watching tv or something while I am showing off the first of my Stripy Socks for Joey, and he mentions he thinks he wants to knit himself a scarf for this winter. And to my even bigger surprise, our other roommate Eric chimed in that he thought he’d like to give it a try as well. (I’m sure they were inspired by the excitement of a FO.) So we made plans to head to the yarn store the next night to pick out yarn. Eric knitted a few rows, got frustrated because there was some weird mistake he didn’t know how to fix, and ripped. All hope is not lost. I think if I cast on and get him going again, he’ll give it another shot. And here’s Aaron’s progress. He even stayed up late the other night, probably thinking “one more row…” Folks, I think that’s called a Conversion.